SilkPeel® Dermalinfusion® is a non-invasive skin rejuvenation procedure. 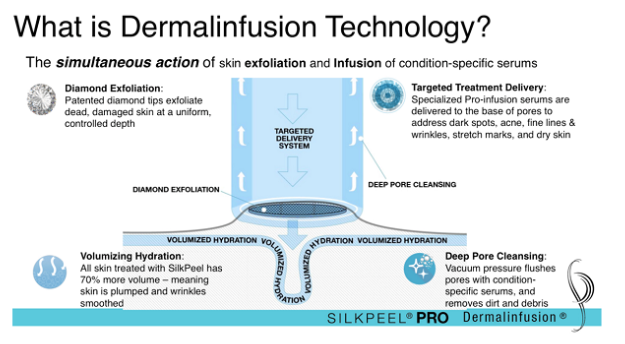 The only technology to provide simultaneous exfoliation, evacuation and the delivery of condition-specific topicals, SilkPeel Dermalinfusion offers advanced skin care for almost every skin type and condition. SilkPeel's diamond tip handpiece exfoliates damaged skin cells, evenly abrading the top layer of the skin in order to deliver targeted formulations to the epidermis. Be it acne, aging, pigmentation or other ailments commonly affecting the skin on the face or body, the Dermalinfusion process delivers specifically-formulated solutions deep into the skin without damaging its natural structure. SilkPeel is customizable, effective and offers immediate results with no downtime. This clinically-proven concept of skin resurfacing can be used by itself, as a way to optimize your laser treatments or as the finishing touch to a facial surgery procedure. Patented diamond tips exfoliate dead, damaged skin at a uniform, controlled depth. Specialized Pro-infusion serums are delivered to the base of pores to address dark spots, acne, fine lines & wrinkles, stretch marks, and dry skin. Vacuum pressure flushes pores with condition-specific serums, and removes dirt and debris. Visible results are evident after this therapeutic facial. Medical strength antioxidants C, E and Ferulic penetrate deeply to help reduce fine lines and wrinkles. A specialty vitamin C masque is used to deeply hydrate & rejuvenate the skin. Followed by a facial massage to increase circulation, creating a youthful tone. A neck, décolleté and shoulder massage completes this therapeutic, relaxing treatment. Designed to clear existing blemishes and prevent future breakouts. This soothing treatment deep cleans pores, calms redness and re-balances the skin. Suited for oily or congested skin. The perfect treatment to educate and promote proper skin care techniques for teens 12 & up. Appropriate skin care can minimize blemishes, oil and problem breakouts. This specialized facial for youthful skin includes skin analysis, cleansing, exfoliation and mask. Ideal for the client who desires luminous, hydrated skin. Antioxidants repair sun-damaged skin and protect against future skin aging. This facial leaves the skin feeling and looking healthier with a radiant, younger-looking complexion. Suited for sun damaged, dull and mature skin. This customized facial treatment combines deep cleansing, exfoliation, extractions and an individualized hydrating treatment mask and moisturizer chosen to help restore, balance and replenish the skin. Suited for all skin types. Our back facial involves a deep pore cleansing and steam to lift impurities, followed by gentle extraction, a relaxing massage and a specialized treatment mask, leaving the back with a radiant glow. Gratuities are not included in spa prices and are graciously accepted.